The Royal Highland and Agricultural Society of Scotland (RHASS) has just launched a new name and a new look for its members’ magazine, which is published three times a year. 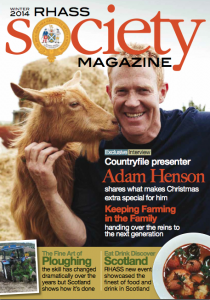 ‘Society Magazine’ will follow the lead of its predecessor, ‘The Review Magazine’ and focus on matters impacting RHASS members. The makeover includes additional content that will appeal to its wide range of members. You can read the very first edition of Society Magazine by clicking on the front cover below.